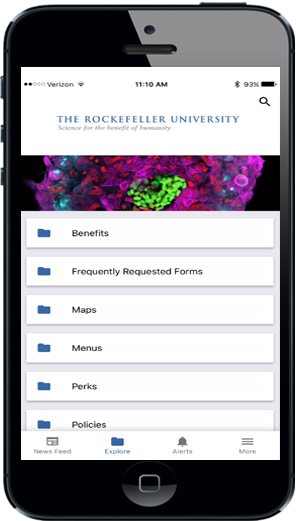 Rockefeller University is pleased to introduce our new app, RUmobile. With the app, you can instantly access current news, directory, calendar of events and more on or off campus. The app is available for use on your iPhone, iPad or Android device. RUmobile is only available for use by current Rockefeller University employees. To download the app, see detailed instructions on Inside Rockefeller. For more information, please visit the Human Resources office in Founder’s Hall 103 or call 212-327-8300. If you need technical help, please send an e-mail to: rockefeller@theempoyeeapp.com. If you would like to provide feedback on the app, please email RUmobile@rockefeller.edu.